1704: By this date, there is evidence of a house on the Dutch House site and records of early Dutch owners. 1738: Dr. John Finney bought the lot at 4th and Delaware Streets with a small house and built the main part of Amstel House. 1774: Dr. Finney died. Governor Nicholas Van Dyke subsequently lived in Amstel House but did not own it. 1784: George Washington visited Amstel House for the wedding of Governor Nicholas Van Dyke’s daughter Anne to Kensey Johns. This visit is recorded on the marble hearthstone in the dining room. 1785: Kensey Johns lived in Amstel House but did not own it. 1700s-1930s: There are records of private owners and tenants occupying Amstel House and Dutch House. 1929: The New Castle Historical Society acquired Amstel House for a museum. The grounds were occupied by a defunct bowling alley, a utility company office, weeds, mangled concrete slabs, and shards of glass. 1931: At a card party, a local resident asked Mrs. Caleb Layton, President of Brandywine Garden Club, if her club might consider planting the garden at Amstel House. The Brandywine Garden Club undertook a restoration of the Amstel House garden as a project for the bicentennial celebration of George Washington’s birth. When the club accepted the project, members agreed to add plants from their own gardens put in by their personal gardeners. It became clear, however, that a great deal more than a few plantings were needed. Early 1930s: Charles Gillette, a Virginia landscape architect, drew up elaborate garden plans for Amstel House that emulated other Colonial Revival gardens of the period and supervised the work of installing the garden. The Brandywine Garden Club realized that they could not maintain the garden, so they asked a group of three New Castle women to help “tend” the garden. For three years, the three women worked side by side with the Brandywine Garden Club on the garden. 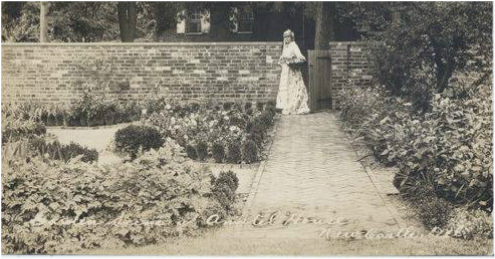 1932: The Delaware Chapter of the Colonial Dames and the National Society of Colonial Wars contributed the Amstel House garden's five foot tall brick wall along 4th Street, built by Williamsburg, Virginia, bricklayers. 1934: On January 25, Arasapha Garden Club was founded when 27 members held their first meeting at the Amstel House. Its initial purpose was the maintenance of the Amstel House garden and the beautification of the town. The club continued “tending” the Amstel House garden for the Brandywine Garden Club. 1936: Mary Chichester DuPont purchased a circa 1789 English sundial and a baluster from a Renaissance-era section of London bridge to be the focal point in the Amstel House boxwood parterre garden. 1937: The Delaware Society for the Preservation of Antiquities purchased the Dutch House for the purpose of restoring the historic site. Wilmington architect Albert Kruse conducted the architectural survey and restoration. Louise DuPont Crowninshield furnished the house with appropriate Dutch furniture. 1938: The Amstel House garden house, designed by local architect Victorine Homsey, was built of bricks scavenged from a house razed on DuPont Highway, old timbers for framing from the Pocopson Bridge, and windows and doors from the old Perkins House in Penny Hill, Wilmington, Delaware. Isabel Booth collected the stones that make up the path in the garden from houses of signers of the Declaration of Independence. The project of the Brandywine Garden Club, now amalgamated with the Wilmington Garden Club, drew to an end. On May 2, at an official ceremony at the Amstel House, the Wilmington Garden Club handed over the key to the garden to the New Castle Historical Society, owner of the property, along with money and bricks for the Delaware Street wall. Arasapha Garden Club was formally entrusted with the care of the Amstel House garden. The Dutch House museum site was landscaped with a garden of shrubs, trees, and flowers facing 3rd Street and an orchard of pears and quince facing 4th Street. We have little documentation of this garden beyond a framed, undated drawing of the garden in the New Castle Historical Society archives. 1939: A smokehouse, a gift of the National Society of Colonial Dames in the State of Delaware, was built on the Dutch House grounds to provide visual interest and serve as an example of the utilitarian outbuildings that likely stood in the Dutch House yard in the 1700s. 1941-1947: A Day in Old New Castle was suspended because of World War II. May Market was founded as a fundraiser for the Amstel House and Garden. 1946: The New Castle Historical Society acquired the Dutch House and grounds. 1952: Arasapha Garden Club assumed responsibility for the care of the Dutch House garden. It appointed a committee to consider a restoration of the garden. With the approval of the New Castle Historical Society, it chose the architectural firm of Victorine and Samuel Homsey, which submitted preliminary drawings and plans in June 1952. 1953: Work on the Dutch House garden began with brick paths and a fence dividing the two sections. 1957: Planting of the Dutch House garden was completed. Report on the 1957 May Market, which featured pony rides, "teen age games," and a fortune teller! ​1980s: The former pear orchard in the rear of the Dutch House garden site was transformed into a perennial garden. Another perennial garden along the right border of the Amstel House garden was created in memory of Brenda Heath, a member of both Arasapha Garden Club and the New Castle Historical Society. 1991: The Arasapha quilt raffle was organized to boost funds raised at May Market for the Amstel and Dutch House gardens. 2004: Arasapha Garden Club, Inc., was incorporated in the State of Delaware as a non-profit corporation. 2005: ​On December 22, the IRS determined that Arasapha Garden Club is a public charity (a 509(a)(2) organization) under Section 501(c)(3) of the Internal Revenue Code, effective October 19, 2004. 2006: A path from the Amstel House parterre garden to the garden house was added. 2011: The Dutch Kitchen Garden was installed in and around the knot garden next to the Dutch House. The space in the Dutch House garden that was once a pear orchard and then a perennial garden was transformed into a native plant garden that is maintained by the New Castle Historical Society.